One thing I have yet to mention on this blog is my love for carnivorous plants, especially those of the gulf coast and eastern U.S. The pitcher plants are flowering earlier this year than I can remember, and after acquiring several new species/hybrids in trades with other pitcher plant enthusiasts last year, I am getting to see many flower for the first time. This was given to me last year as an unnamed clone but I think it is the rare and difficult to obtain cultivar called 'Ares'. Whatever it it is, it's fantastic and has a very distinctive peachy color with hints of orange sherbet. I love it. 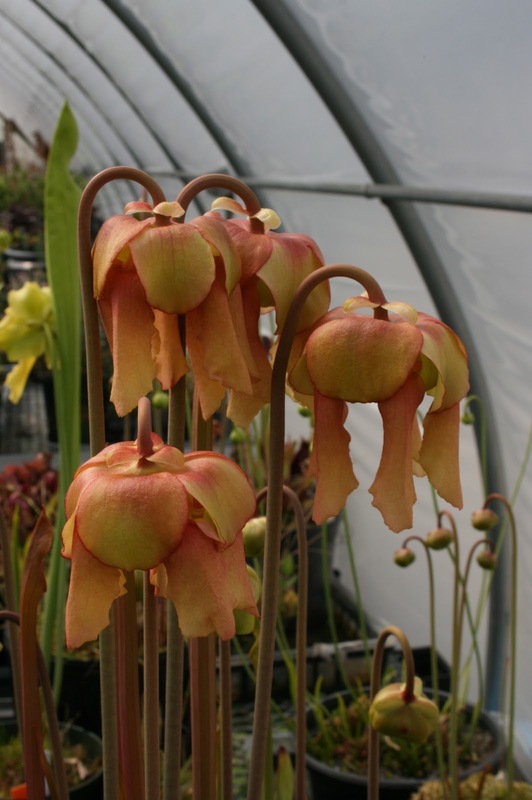 The pitchers resemble those of S. flava var. cuprea and are a very rich copper color with red striping. This is the flower of Sarracenia alata x Sarracenia alabamensis ssp. wherryi that I purchased from Meadowview Biological Research Station. The flowers have great color and form, but are born on short scopes that are obscured by the newly emerging foliage.